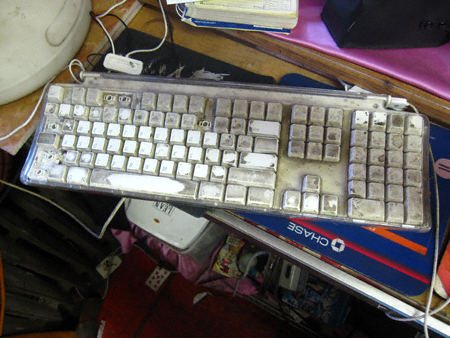 Although I prefer to refrain from blogging at the junk shop (the above image of the company computer’s keyboard should explain why) this just came to my attention and I wanted to pass it along ASAP. Apparently a gentleman’s car (which was parked West and Huron Street) was broken into (the lock was picked) this morning. Among the items stolen were (men’s) hockey gear: skates and a pair of mitts. These were contained in a blue plastic bag. If anyone, dear readers, attempts to sell you anything fitting this description (presumably on the street or at one of our local parks) please bear in mind they may very well stolen property. 6 Comments on 11222 Theft Alert! that keyboard is downright nasty!! One person (who shall not be named) likes to rearrange the keys for shits and giggles. Needless to say this has hilarious results. Truth be told I am used to using PCs— and keyboards with all their keys.